KIEV, Ukraine -- Several dozen journalists rallied outside Ukraine’s Interior Ministry in Kiev on Monday, accusing police of standing by while two journalists covering an opposition rally were beaten. 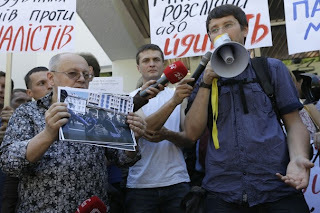 Ukrainian journalists gather outside the Interior Ministry to protest police inaction and refusal to properly investigate and prosecute the beating of a reporter and a photographer during an opposition rally over the weekend in Kiev, Ukraine, Monday, May 20, 2013. A fight broke out Saturday between opposition and government supporters and a young beefy man in a tracksuit from the anti-opposition. Olha Snitsarchuk, a journalist with Channel 5 TV, and her husband, Vladislav Sodel, a photographer with the Kommersant newspaper, were punched and kicked Saturday by a group of beefy young men as they attempted to record a clash between those men and opposition activists during a protest. The protest Saturday was the biggest in several years. After a clash broke out, Sodel and Snitsarchuk rushed to the scene and started taking photographs and filming with a cellphone, Sodel said Monday. Several policemen at the rally ignored his pleas to intervene, stop the fight and protect the reporters, who were being threatened by the thugs, according to Sodel. Then he said two policemen watched as the reporters were spat at, doused with water, thrown on the ground and hit, leaving Snitsarchuk with bruises on her face. The beating stopped after two riot police pushed the attackers away and an ambulance was called for Snitsarchuk. However, the suspects were allowed to flee. Sodel says when he approached several policemen and offered to show them a photograph of the main assailant, the policemen refused to look. “They beat us because we were journalists. We were there and we were recording what was happening,” Sodel told The Associated Press. The Interior Ministry opened a probe into the beatings after a public backlash, first on charges of deliberately inflicting of light bodily harm and later, following angry protests, on charges of hampering journalistic work. During Monday’s rally, the activists held posters reading “Shame to passive police” and chanted “Minister! Minister!” demanding that Interior Minister Vitaly Zakharchenko come out and answer their questions as well as oversee a thorough investigation into the beating. Oleh Tatarov, deputy chief of the Interior Ministry’s main investigative department, said the main suspect has been identified, though not yet arrested. He also said an investigation was under way into alleged inaction by police at the rally.